Choose from our range of United Airlines flight tickets from Hong Kong to worldwide destinations below. Talk to one of Flight Centre's consultants to make a booking or get a quote. If you can't find the destination you're looking for, contact one of our friendly consultants on 2830 2899 or enquire online now. If you are looking to change an existing booking made directly with United Airlines, please contact the airline. 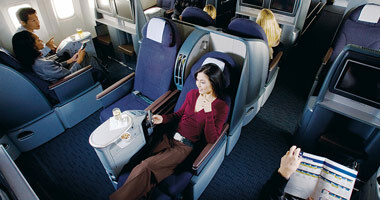 Find cheap United Airlines airfares from Hong Kong now! Choose one of their popular destinations below or contact 2830 2899 today and ask about our great United Airlines deals. Our all-in fares include taxes and fuel surcharges. In April 2014 United will switch aircraft types for its Australia to U.S.A. services, replacing the Boeing 747 for the Boeing Triple 7. The more modern Triple 7 aircraft brings enhanced passenger amenities and comfort and will feature seats with four-way adjustable headrests and a personal seat back video screen for on demand entertainment. While economy class seats can be a bit tight when it comes to leg room, Economy Plus, while still a standard economy seat, offers up to 5 inches of additional space, an amount more than adequate for even the tallest passenger. Economy Plus is available for an additional charge. For United Mileage Plus Premier, Platinum, Gold and Silver members, Economy Plus may be booked in advance at no charge. Entertainment: From April 2014, United will feature personal seat back video monitors for on demand entertainment on its Australia to U.S. routes. Entertainment choices include up to 150 movies, almost 200 TV shows, many interactive games as well as a huge collection of music. Headphones are supplied at each seat and entertainment may be started, stopped and paused. If travelling in United’s 747 Economy prior to the switch to Boeing Triple 7 aircraft in April 2014, entertainment consists of pre-selected movies shown on one shared screen in front of the cabin. Food and Beverage: Travellers flying in United’s economy section on long haul flights are treated to complimentary meal and beverage services with in-flight snacks served mid-flight. All beverages are complimentary with the exception of alcohol. United’s Business First offers an exclusive cabin and a long list of features and amenities. The comfortable business class seats transform into a fully lie flat bed and are accompanied with a soft duvet and fluffy pillow when you’re ready for some sleep. Another business class bonus is the amenity kit which is filled with premium skin care products and other travel necessities. The special treatment extends to airport services as well with a dedicated check-in line, priority boarding and deplaning as well as access to the United Club or Star Alliance member lounges. Entertainment: Each business class seat comes equipped with a large TV monitor for on demand entertainment with over a hundred hours of movies, shows and music. Noise cancelling headphones offer superior sound quality and are available at each seat. Laptop power and USB ports are also featured allowing continuous use of personal electronic devices. Add a complimentary newspaper and in-flight duty free shopping and Business First passengers will find hours of entertainment on hand. Food and Beverage: The pampering begins the moment you step on board. Enjoy a pre-departure drink as you get settled in for your international flight. Menus include varied selections of international and local dishes which can be selected from the menu distributed before take off. A wide range of beverages include premium beers, fine wines and other spirits. Dessert items include fresh fruit, cheese plates, liqueurs and signature desserts. Mid-flight snacks and a light meal before landing are also served. United’s first class is the ultimate in comfort and service. Available on flights between Australia and the U.S., Global First on United’s Boeing Triple 7 aircraft is an intimate cabin featuring only 8 seats. The advanced seat turns into a generously long lie flat bed and is equipped with lumbar support and back stimulation features. A thick duvet and comfortable pillow are available with turn-down service when you’re ready for a restful sleep. Global First guests enjoy perks on the ground too from Premier access check-in, priority security lanes where available as well as priority boarding, deplaning and baggage. Complete lounge access is also available in United’s Global First Lounge, United Club and Star Alliance member lounges and United Arrivals Lounges. 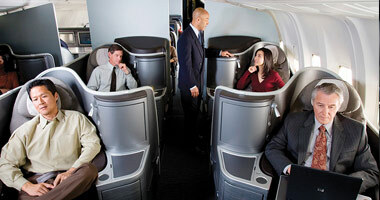 Entertainment: There is a full range of entertainment options in United’s Global First cabin. On demand programming is available on a large 15 inch screen while noise cancelling headsets enhance the listening pleasure. Over 150 hours of programming is available and includes everything from movies, shows and games to a huge music collection. There is also a laptop power point and USB port allowing passengers continued access to their own entertainment collection. Food and Beverage: Enjoy a pre-departure beverage service, hot towels and a full menu consisting of a choice of starters, mains, desserts and snacks all individually prepared and individually served. There is also a wide variety of drinks including juices, sodas, premium beers, international wines, spirits and liqueurs. Travellers are allowed one piece of hand luggage and one personal item such as a shoulder bag, laptop bag or similar. Coats, a diaper bag and reading materials are also allowed. The maximum size for hand luggage cannot exceed 22cm x 35cm x 56cm including handles and wheels. Liquids, gels and aerosols must be in containers no greater than 100ml or 3.4 ounces and packed in a clear, sealable bag. United Premier Gold, Platinum and 1K frequent flyer members are allowed an additional bag at no charge in the corresponding class of travel. Many bulky items such as surfboards, bicycles and other sporting equipment are charged an additional fee due to size and weight. There are items however that can be checked in lieu of a checked bag. Your Flight Centre Travel Expert will be able to advise on specific items at time of booking. A diaper bag and approved car seat may be carried in the cabin in addition to the standard carry-on allowance. Additionally, one stroller or pram or one car seat may be checked for free. If infants are travelling on a fare that is 10 percent of an adult fare, the infant will receive a baggage allowance of one car seat, one stroller or pram and one additional bag not exceeding 23kg with linear dimensions no greater than 157cm. A car seat or child seat must be certified for use in aircraft and motor vehicles. Hazardous items and dangerous materials such as flammable liquids, gases and solids, explosives, corrosives, poisons, paints and other items are never permitted in checked luggage or carry-on baggage. For a complete list of goods that are prohibited from travelling, consult with your Flight Centre travel expert. Some lithium batteries such as those used for wheelchair use may be permitted in the cabin but must be declared. Online check-in is fast and simple. Passengers may check in for their flight starting 24 hours before departure. Boarding passes may be printed or sent to a personal mobile device where they can be saved. Online check in is available from the U.S. and most international destinations. For online check in, the first flight of the itinerary must be on a United operated flight and the booking must contain four or less segments with less than 9 people. Airport kiosks are available in U.S. airports and many international airports. Kiosks allow passengers to print boarding passes, change seats and declare baggage amounts. Once checked in, simply proceed to the bag drop off counter where passports and documentation are checked. Airport check-in counters in Australia are open for specified time periods, usually from 3 to 4 hours before flight departure. Counters at major U.S. airports are open throughout the day. Dedicated lines for Business, First and Mileage Plus Gold, Platinum and 1K are available. There are 45 United Club lounges located throughout the world in addition to hundreds of Star Alliance lounges. United First and Business passengers as well as Mileage Plus Gold, Platinum and 1K members departing from Australia have use of Star Alliance member Air New Zealand lounges. The United Airlines Mileage Plus program rewards passengers who fly on United, United Express, Star Alliance and other partner airlines. Points can also be earned for car hire, hotel stays and more. Points may be used for rewards including flights, upgrades, lounge access or membership, hotel stays and car rentals. Chicago-based United Airlines has the world's most comprehensive global route network, travelling to more than 350 destinations.